This symbol, and saying, have been a part of the American vocabulary since World War Two. And the story behind it is not often told. In a way, it involves Christmas, so I figured this was a good time to tell the story behind the words "Kilroy Was Here." During the Second World War, when the United States was turning out ships and planes at a rapid rate, "checkers" were required to make the rounds of the shipyards and factories, inspecting the work. When they were done they placed a mark, with chalk, on the item to show that it had passed inspection. The appropriate riveter/welder would then get credit for the work, and hence, paid accordingly. Soldiers began to see these marks, along with the words "Kilroy Was Here", wherever they went during the war. Wherever they went, they assumed they were the first, only to be greeted by the words that had become a slogan. There were now several Kilroys from coast to coast. But only one was the original. There was even a joke circulating about at the time of the Potsdam Conference. It was alleged that an outhouse had been built for the exclusive use of Truman, Stalin, and Churchill. The first person to use it was Stalin. When he finished and came out he asked his aide, "Who is this Kilroy?" At any rate, fast forward a bit to the end of 1946. The Second World War was over and the shipyards were shuttered. James Kilroy was facing a bleak Christmas, with no toys for the kids. That's when he first heard of the search for the real Kilroy! 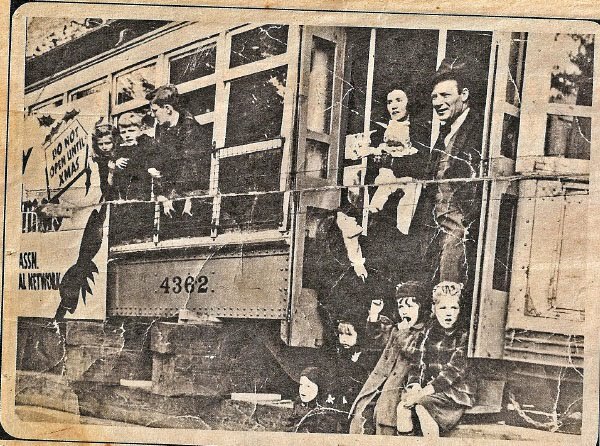 This photo, from the Boston American, dated December 23, 1946 shows the family with the trolley in their front yard. But the whole story really involves how it almost didn't make it on time. The Transit Company of America had held the contest, offering as a prize, a real trolley car to the individual who could prove that they were the "real" Kilroy. Of the forty odd men who made that claim, only James Kilroy was able to produce officials from the shipyard, and even some of his fellow riveters, to prove his claim. Having won the prize, he now had to get it home! And there was a blizzard coming! 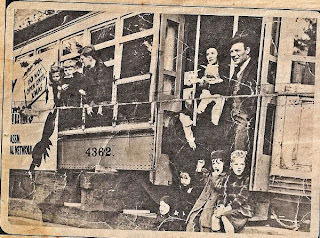 But, with the help of the Transit Company of America, and a local railroad spur, along with a truck and a crane, the trolley was delivered on time, where it served many years as a playhouse for James Kilroy's children. It was a Christmas they would never forget. And that, as Paul Harvey would say, is the rest of the story. Merry Christmas everyone. Hope your day is filled with miracles!